Shevala is an edible, exotic vegetable, botanically related to the family of Suran Flower. 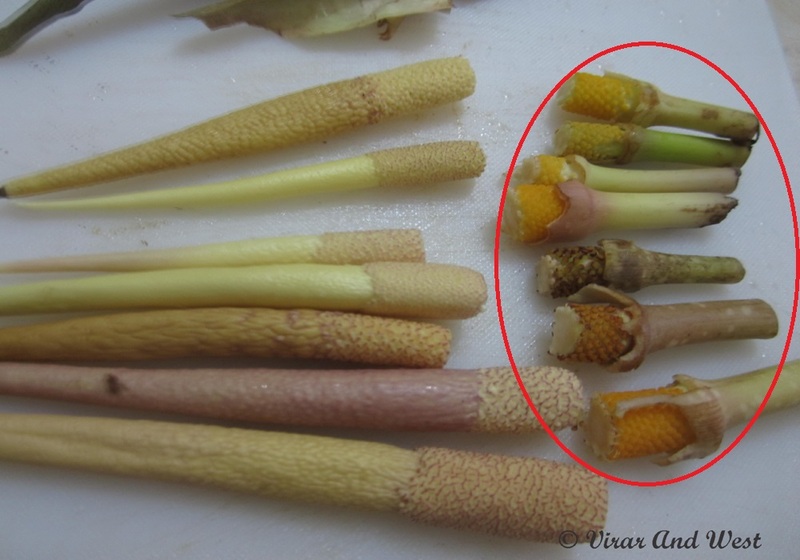 You can compare the similarity with the help of pictures (especially the inflorescence structure). Both, Suran flower and Shevala taste similar after cooking and have a very limited season. The difference is Shevala is not a plant grown on farms. You can find Shevala in the markets of Virar, Vasai, Goregaon and Dadar in starting 2-3 weeks of June. (In earlier version of this post I had written that they are found after first rains. Well, it hasn’t rained yet this year and I just bought it from the market. The vendor explained that the one that grow before rains are called dhulicha shevala (Shevala of dust), they taste better, she claimed). 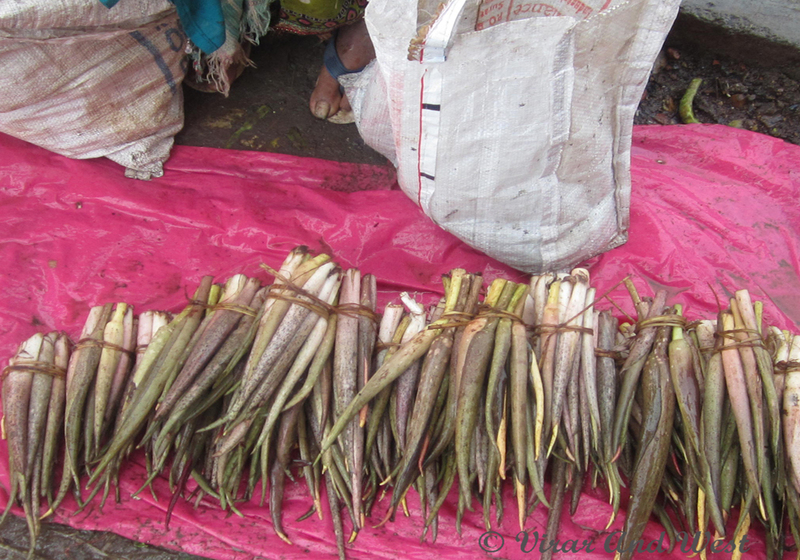 This one is forest grown plant plucked by the local tribe mainly Katkari’s from the Interiors in Thane District. 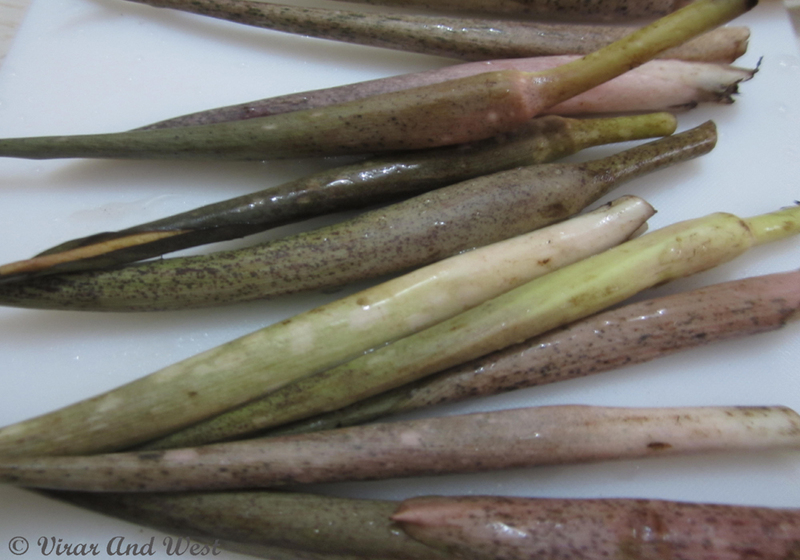 It is also found in Konkan region and called Lotadi though commonly city folks are unaware of this wild veggie. The Katkari’s sell them to the local veggie sellers and they bring it to the markets of nearby Mumbai suburbs, mostly western suburbs. In Virar, you can find Shevala in Bazaar that takes place everyday from 7a.m. to 9 a.m in the ground near Virar-Vasai Mahanagar Palika (Virar East). You might also find it in West of Virar, near Railway Station. Shevala is an itchy veggie like Taro leaves (Alu). 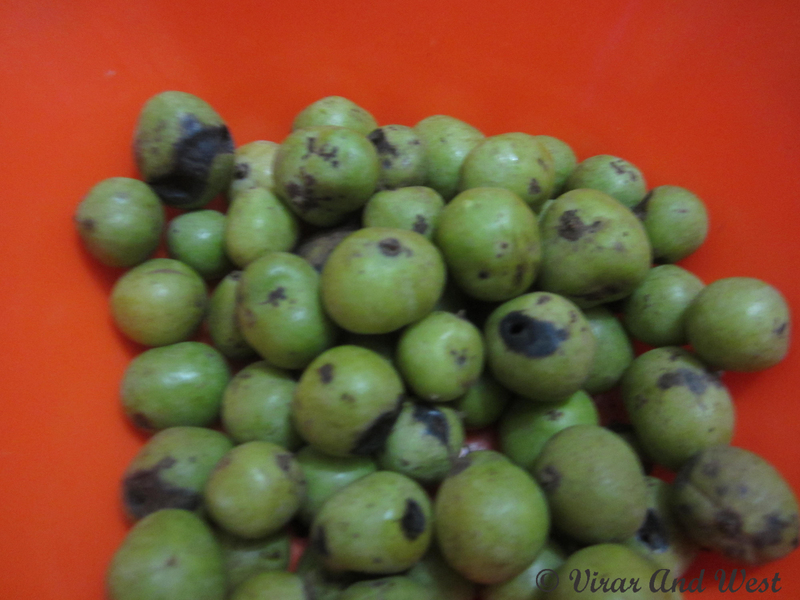 To counter this the seller will also hand you some green fruits that resembles emblica. They call it Kakada. Cut them, remove seeds, grind in grinder and add the extract while cooking. Like Suran Flower, Shevala too has a part with pollen grains, the third down most segment, that is cut off and not used in cooking. 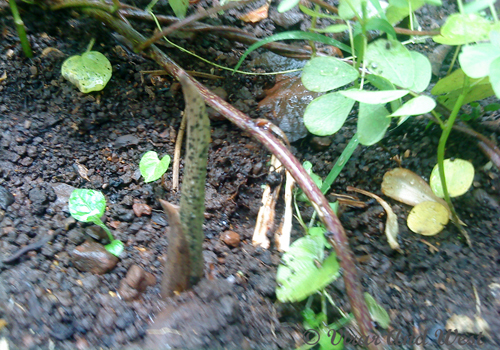 Only the rest of the inflorescence (Spadix) and the immediate leaf cover (Spathe) is used. You can cook Shevala exactly as per Suran flower recipe given in the previous post or try one below. Fry the garam masala ingredients separately in two tbsp oil, grind the masala with some water. Keep aside. 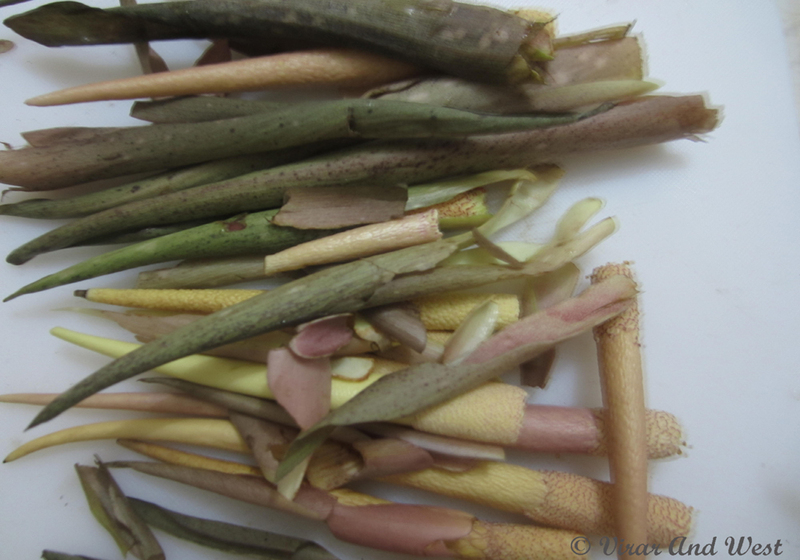 Chop Shevali in small pieces. Heat oil in a pressure cooker, put one pinch of asaefoetida and fry the chopped Shevali crisp. Add onions and fry it again. Add everything other than the Garam Masala paste i.e, chilli powder, turmeric powder, field beans( you can use gram or moong daal), coconut, tamarind juice, water and cook till beans turn soft. Now add Garam masala paste and salt and boil for two minutes. It is ready. Three things that are Primary requirement in cooking Shevala- A tempering of Asafoetida and crisp frying in good amount of oil(Just like Taro leaves), secondly adding kakada extract and third tamarind extract. Crisp fried Shevala on Asafoetida tempering can be preserved for six months by keeping it in an airtight container and deep freezing it in the refrigerator. 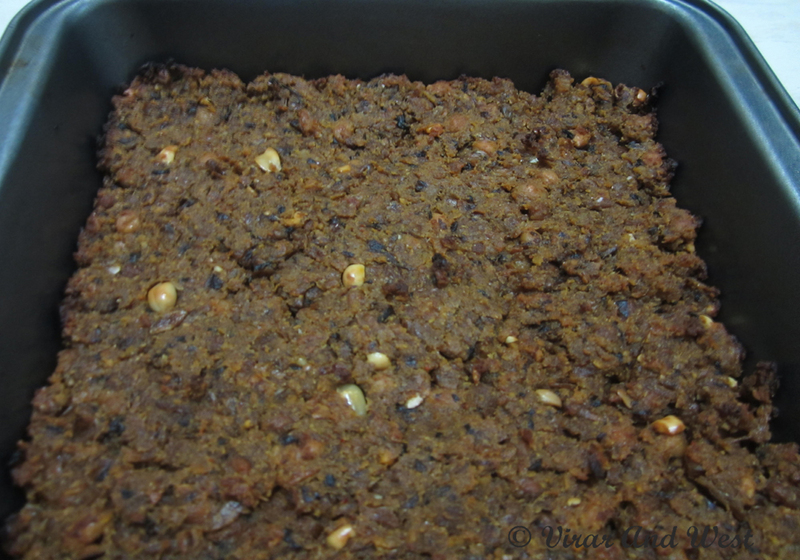 Non vegetarians add Kheema(cooked minced lamb meat) or prawns to it. You can also make delicious patties or wadi which is very popular like Alu wadi. 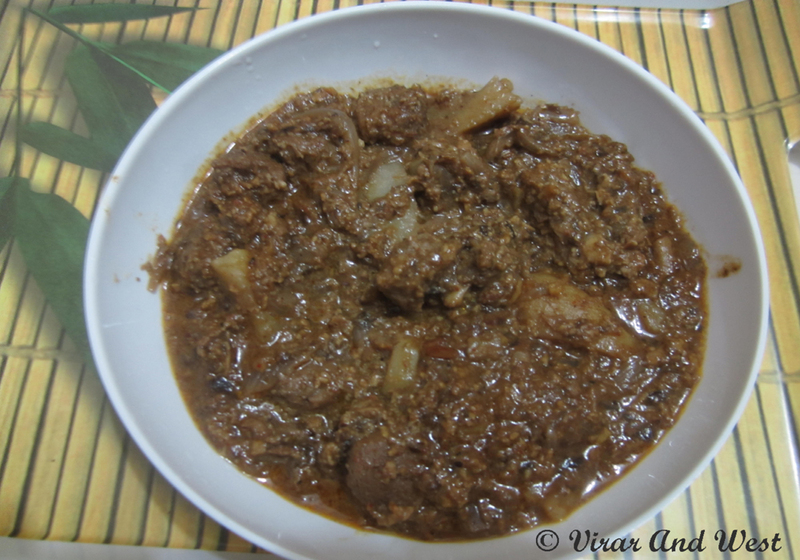 To make a really good wadi, use leftover shevali curry or purnachi bhaaji which has spices already soaked by Shevali. Add some rice flour and besan flour. Now shallow fry or bake it in oven. One important tip is that adding beans, meat, pulses or simply rich coconut gravy is vital to this veggie. It alone has no taste but brings exotic flavor to the recipes by its presence. 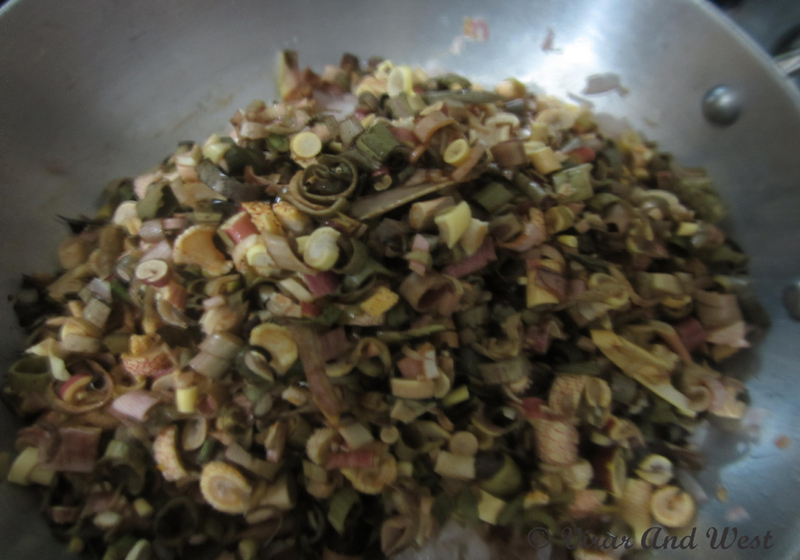 Shevala also tastes very good with Gram Dal or adding Soyabean Chunks. Just treat your dish royally. Do share with us your recipes if you are already familiar with this veggie. Email it to twocents@virarandwest.com and we will publish it here with the senders name. Hurry, because the season is going. We CKPs wait for monsoon for this vegetable. I know Sujata, and it’s really worth the wait. Wish it were available throughout the year. It is available mangaon taluka, raigad. Abundant quantity. We love to eat it & share among out relatives. This is traditional from our grand grand parent’s. Veggie with non veg is more testy. Good to learn one more place where Shevala is found, Pradeep Soshte. Thanks for informing.